When taking paid surveys online, you can usually get paid in one of three ways – in cash, products or gift cards. Many people (including myself) prefer getting paid in cash when taking surveys. One of the easiest ways to get your cash paid out from survey sites is through PayPal. However, not all survey sites offer cash payment and not all sites offer it through PayPal. So in this article, I will give you a list of the best survey panels that pay through PayPal in 2019, so you can easily focus on these if you prefer this reward. Why use PayPal to get paid for surveys? Before getting to the list of the best sites, let’s first go a little deeper into what PayPal is, and why so many people prefer getting paid for taking surveys this way. First of all, PayPal is a very reliable platform and is very secure and available in most countries. For that reason, it is also the payment method used by most survey panels that offer cash rewards. PayPal is in general also pretty strict when it comes to the companies they work with, so it is in many cases also a sign that a survey site is legit, if it offers payouts through PayPal (you can check out my article about avoiding survey scams, if you want to know more about how to spot the sites that are not legit). Another advantage of using PayPal is that it is very easy to use, you can have an account for free (visit PayPal’s website to get a free account), and because of its popularity, you can use it as a payment method at a lot of different places. So whether you want to spend your reward on buying products online, pay for different subscriptions, buy flights or have the money transferred to your local bank account, it is super easy and fast. These are some of the reasons PayPal is a very popular reward option on survey sites, and also the reason it is my personal favorite way to get paid for taking surveys. How does payment through PayPal for surveys work? If a survey panel offers PayPal surveys, you can just select this as a payment method in the payout or reclaim reward section. Then when you reclaim your reward, you will get paid that way. PayPal uses your email address to identify you, and when a survey site asks for your PayPal details to know where to transfer the money, it is just the email you have used to register at PayPal you have to give. So it is super easy. Be aware that some survey sites automatically think the email address you registered at their site with is also the email you have for PayPal. So if you have several email addresses, be sure to coordinate this, so you will get paid to the right account. At some survey sites, you even have to have a PayPal account to sign up, as this is the only form of payment they offer. How long it takes from you have requested a payout from a survey panel until the money is in your PayPal account really depends on the survey panel. In most cases, it takes a couple of days. But there are also cases where it can take weeks, and other surveys that pay instantly via PayPal, which means you will get the money into your account more or less right away. So it depends on the specific sites you are are a member of. The payout threshold is different on each survey site. On some sites, you have to earn $30 or more to get paid through PayPal, and on others, you can get paid already when you have earned $1. On the list below, you can see what the payout threshold is on the different sites, so you will know how soon you can get paid. You can also read how long the processing time approximately is on some of the sites, so you know approximately what to expect. Is PayPal the only way to get paid in cash for surveys? Before getting to the list of panels that offers this payment method, I just want to mention that there are other ways to get money for doing surveys than just PayPal. 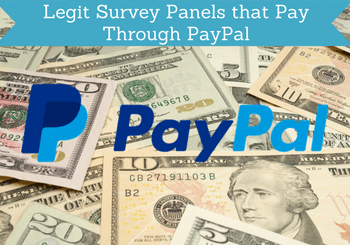 PayPal is by far the most popular and the method offered by most survey panels, but there are also panels that do not offer this or offer additional methods as well. Some panels offer payment in cash through check, and others offer through other online payment platforms like Payoneer, Skrill, Tango, and Paytoo. On the list below, you will be able to see which survey panels offer other payment methods as well. Be aware that many of the sites also offer other earning opportunities than just paid surveys. So if you want to boost your PayPal earnings, it can be a good idea to use some of the other options as well. Below you can see a list of the best survey sites that pay out through PayPal. They are all legit and good sites, but which ones are the best for you can vary depending on the country you live in and your preferences. So read the overview below, to see which ones seem most appealing to you, and you can then read my full review of each of them if you want further information before signing up. To increase your chances of earning, it is a good idea to sign up for several sites. If you have not done paid surveys before, I recommend signing up for 4-6 sites so you get a good amount of opportunities, but it will still not be too overwhelming. Then you have time to get to know the platforms you join, and then you can join more later. So make sure to bookmark this page, so you can come back and find the legit sites if you want to join more later. The list is also regularly updated with new opportunities, so make sure to come back and check it once in a while. Available in: Worldwide, but most opportunities for US, UK, Canada, and Australia. PrizeRebel has many daily opportunities for doing paid surveys, and also has quite a few other ways to make money. You can do small online paid tasks, take a number of different offers like for example signing up for websites, playing online games, downloading apps etc. that can give pretty good rewards. It also often offers promo codes that can give you free points, and a number of different free contests. In general, PrizeRebel is a great platform for earning some extra money and one of the top sites for this. You can sign up from most parts of the world, but the number of possibilities varies depending on where you live. There are by far the most opportunities available in the US, the UK, Canada, and Australia. But there are also very good opportunities in many other countries, so it can still be worth signing up if you live in other countries. In addition to paying out through PayPal, PrizeRebel also has a large number of gift cards to choose from. You can get paid through PayPal already when you have earned $5 and you will usually have the money in your PayPal account in less than 24 hours after requesting the payout. Available in: US, Canada, Australia, Ireland, UK, Germany, France, and Spain. Swagbucks is one of the biggest players on the market when it comes to paid surveys and rewards sites. It has more than 20 million users and offers many daily opportunities to make some extra cash. Not only through surveys, but it also has some really good cash back offers, if you like doing shopping online, watching videos, contests, games, and several other methods to earn. Unfortunately, it is not available worldwide, so you can only join if you live in one of the above-mentioned countries. But if you live in one of these countries, it is a great site to join. And it has a big joining bonus of $5 if you join through the invitation link below, so it will give you a great start and take you closer to the payout threshold, which will not be difficult to reach with all the opportunities Swagbucks offers. In addition to offering payout through PayPal, Swagbucks is also offering a large number of different gift cards as a reward option. Toluna offers several weekly surveys, and sometimes even several a day. It further has a community, where you can interact with other members, and you can also here earn points that can be exchanged into cash. Toluna regularly runs different kinds of contest or challenges, where you can earn a bit extra, and also sometimes offers that you can sign up to test new products, where you will get the product for free, if you test it and give feedback. It has survey sites in many countries in the local language, and in most of them Toluna offers to payout through PayPal, and it also has gift cards and products as a reward option in most countries. The exact payout threshold and processing time depends on the country. GlobalTestMarket is a big international survey panel that is very easy to use, and it has panels in many countries in the local language. Once you have signed up, you have to fill out your profile, and then you will start receiving invitations for surveys. You will receive an email every time there is a new survey you can participate in. Usually, this will be between 4-10 times per month depending on where you live. Not as many as other survey sites offer, but still an ok amount for making a bit extra. The easiness and reliability of GlobalTestMarket make it a site worth joining. It also has an app that makes it very easy to take surveys on the go. In addition to PayPal payment, GlobalTestMarket also offers some gift cards, and it has its own lottery where you earn entries into by taking surveys in addition to the cash you make. If you are lucky, you can get a really good extra reward like this. Once you have requested a payout through PayPal the processing time is usually around 4-7 days. YouGov has survey panels in many different countries and in the local language. The surveys are mostly about current and important topics in your specific countries, so they are interesting to participate in. A great thing about YouGov is that they regularly post the results of the surveys and research the conduct on the website, so you can see the overall results, and also see how this has been used by the media. It pays pretty well in relation to the time spent on each survey. As the only way to earn is surveys, it does not have has many daily opportunities as the sites that offer other ways to earn as well, but for a pure survey site, it has a really good amount. Beware that it is not in all countries YouGov pays through PayPal. You have to check for your specific country, as each country has different payout methods and payout thresholds, but the ones that do not offer PayPal have other great rewards. PointClub is a modern survey site with a fun and engaging design. It offers a good amount of surveys in the countries mentioned above, but you can also find some opportunities in some other countries. It has a great bonus system, where you get a higher reward for surveys if you log in every day. You can get up to 100% bonus. In addition to paying out through PayPal, you can also choose from more than 80 gift cards. The payout threshold through PayPal is a bit high compared to some other sites on this list, but it offers a $5 joining bonus, which will give you a great start and take you closer to the threshold from the start, so it will not take you too long to reach. PointClub has great customer service, and it gives a great user experience, so definitely a site worth checking out, if you live in one of the countries, where it has good opportunities. FeaturePoints is available for all countries. The number of opportunities will, however, vary depending on the country you live in. But in many countries, you will find good earning opportunities. You can, for example, earn by taking paid surveys, watch videos, download apps, and get cash back when shopping online. It is also very easy to use on the go as it has a great app. The payout methods are one of the best things about FeaturePoints. It does not only offer PayPal as a payout method, but you can also get paid through PayPal already when you have earned $1. Other payout methods are gift cards and Bitcoin. Superpay.me offers many daily opportunities. Exactly how many depends on your location. It can take a bit of time to test the different opportunities and find out which surveys and other offers you can take, so be a bit patient in the beginning when testing it out. Superpay.me has one of the lowest payment thresholds, and you can request a payout through PayPal as soon as you have made $1, and you will have the money in your account within 24 hours. Once you are a verified member, you can also request to be paid through instant PayPal, which means you will get the money you earn instantly. Because it is a bit confusing to use, it is not higher on the list, but it is still on the list because it has some great potential and a very low payout threshold, which is great. Available in: Mostly US, UK, Canada and to some extent Australia. PaidViewpoint is a very easy to use survey panel. The only thing you can do on the site is surveys, and compared to other survey panels, PaidViewpoint is a bit different in the way that all surveys are very short and with easy to answer multiple choice questions. The only payment method offered is PayPal, and once you have requested a payout, the processing time is around 3 days. PaidViewpoint is the only survey panel that I am aware of that guarantees that if you are offered a survey, you will always be able to finish it and get paid. So it is not like some other panels where you often have to answer a few questions before you find out if you actually qualify. Even though PaidViewpoint is available worldwide, there are very limited surveys in some countries. Everyone is able to take a short profile survey every day that also pays a little, but real surveys that pay better are not available in all countries. Most surveys are for English speaking countries and especially the US. So if you live in a non-speaking English-country, it is not a site worth joining. OpinionWorld is another very simple and easy-to-use survey site that offers PayPal as a payout method in most countries. Which other payout methods it offers depends on the country you live in. It offers a decent amount of paid surveys, and as the PayPal payout threshold in most countries is only around $5, it will not take long to reach. Paid surveys in the only way to earn on OpinionWorld but it also offers a quarterly prize draw where you can win some big cash prizes. You earn entries into the draw by taking surveys on the site. GrabPoints is a get-paid-to site with quite a lot of different earning opportunities. This also means that in the beginning, it might take a little time to get to know how to use the platform, but it is not too complicated. You can earn by taking paid surveys, watching videos, take offers, download games, and if you join through the invitation link below, you will get 500 pints joining bonus. GrabPoints has some good payout methods and the threshold for getting paid through PayPal is only $3. The threshold is different depending on the reward, but as you can see, it is very low if you use PayPal. 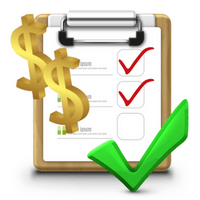 MySurvey is an easy-to-use survey site, where the main way to earn is by taking paid surveys. You can also earn by participating in the monthly sweepstakes, or by inviting friends to join, and it occasionally offers product testing as well. It has an app that makes it easy to use on the go and is available in quite a few countries. It has a good payout threshold for PayPal on $10. The payout threshold for the other available rewards depends on the specific reward. SurveyRewardz is a great PayPal survey site, as it pays out very quickly. You can get paid already when you have made $1, which is a very low payout threshold and the big advantage of this survey site. SurveyRewardz offers a good amount of surveys. When you are logged in, you can start scanning for available surveys. It sometimes takes a bit of time to find the available surveys, but it, in general, has a good amount – especially for the US, Canada, Australia, and the UK, but you can also join it from other countries, but you will likely have fewer opportunities. In addition to paying out through PayPal, SurveyRewardz offers to pay you by check or Amazon gift cards. Viewfruit offers a very good amount of paid surveys in many countries. It is one of the survey sites that does not only offer really good opportunities to English-speaking countries, but also has many opportunities for Asia and some European countries as well. It does not take long to reach the payout threshold, as you only have to earn $5 to get paid through PayPal, which will not take long in most countries. In addition to earning by taking surveys, you can also participate in polls on the site and build up survey teams with your friends to earn more. Panel Station is not so much a survey site as it is an app. You can join it through the website, but the main way to take surveys is through the app. It is easy to use, and with a threshold of only $5 to get through PayPal for taking surveys, it does not take too long to reach the threshold and get paid. It is however not the panel with the most opportunities, but it can definitely still be worth checking out. If you at some point want other rewards than PayPal cash, you can also choose between different gift cards. The exact cards depend on the country you live in. InstaGC is one of the sites that offer many different ways to earn. In addition to paid surveys, you can also earn by taking Figure Eight tasks, watch videos, play games, signing up for free trials, downloading apps, betting on sports games and more. Even though it is open to all countries, the opportunities can vary from country to country. Most opportunities are for English-speaking countries, but it will also have some decent opportunities in other countries. It takes a little time to get learn to navigate and find the best opportunities on the site, but with a little patience, it can still be a site worth considering. A great thing about InstaGC is that you can not only get paid through PayPal – you can get paid already when you have earned $1, which means that you can get a payout very quickly. Survey Junkie is almost what you can call a pure PayPal survey site as the main way to earn is by taking surveys, and in some countries, the only way you can get paid is through PayPal. Sometimes you can also find other ways to earn on Survey Junkie. In the sign-up process, you can say if you are interested in participating in focus group interviews, product testing, or phone interviews. When they have these opportunities available, you will then be told. It can be a good way to really boost your earnings. But day-to-day, the main way of earning on Survey Junkie is by taking online surveys. Gift Hunter Club is get-paid-to website, as it offers several ways to earn money. In addition to taking surveys, you can also watch videos, take Figure Eight tasks, take offers, get daily bonuses, and more. It is easy to use and has an app that makes it easy to use on the go as well. It has a decent amount of surveys for US, UK, Spain, and Latin America, but you can also find some opportunities in many other countries. It, of course, offers PayPal as a payout method since it is on this list, and you can get paid when you have earned $5. There is however a fee of $0.30, if you cash out to PayPal before you have earned $10. You can also choose to get paid in gift cards. Cinchbucks is a get-paid-to (GPT) site with several ways to earn. At first, it can be a bit confusing, and it does not pay quite as well as some of the other GPT sites on the list. But it still gives pretty good opportunities. You can, for example, earn by taking surveys, watch videos, and paid offers. It offers more opportunities, but these are in my experience the ones that are the best to use on Cinchbucks. You can get paid in cash through PayPal when you have earned $10, and you can also choose to get paid in Bitcoin or gift cards. Prolific is a survey sites that is a little different than many other survey sites. It is only offering surveys related to scientific research. This means you can get paid to participate in surveys that are requested by researchers around the world. As it is only this kind of surveys it offers, you will not be offered surveys very often compared to many other survey sites, but it can be a great way to contribute to modern research. You can get paid through PayPal once you have earned $7. There will however be a small fee for this. If you wait until you have earned $28, there is no fee, but with the number of surveys you get on Prolific, it will take a while to reach that amount. Qmee is an interesting panel as it is a site where you can take PayPal surveys and get paid instantly, as it does not have a payout threshold. Personally, I prefer waiting a bit as it makes more sense to get a transfer when you have a bit more in your account. But it is nice to know that you can get you money through PayPal as soon as you want to. You can earn by taking surveys, and you can also get cash back when shopping online or earn whole surfing online if you install the Qmee browser extension. EarningStation is a get-paid-to website only for the US, but if you live here, it is a great site to earn money to your PayPal account, as it has many different ways to earn. In addition, to take online surveys, you can also earn by taking offers, bonuses for logging in every day, watching videos, playing games, reading emails, and more. It has a good amount of opportunities. The PayPal payout threshold is a bit high, but still realistic to reach within a reasonable time, because it has so many ways to earn. In addition to offering PayPal as a payout method, you can also choose to get paid in gift cards. GreenPanthera offers several daily surveys, and you will get an email every time there is a new survey available. The surveys pay pretty well in relation to the time spent, which is a big plus. Unfortunately, you will receive many emails with invitations to surveys that you will then find out you do not qualify for after you have clicked the link. It is annoying having to click many invitations before getting one you can take, but luckily it only takes a few seconds, before you will know whether you qualify or not. But because of the decent rewards and easiness of the site, it is can still be worth considering, if you have the patience to click several invitations before you find a survey you can participate in. PayPal is the only payout method offered by Green Panthera. Unfortunately, the payout threshold is a bit high, as you have to earn $30, before you can request a payout, and it takes a little patience to reach on this site. Available in: Worldwide, but most opportunities for US, UK, Canada, Australia, Germany, and France. CashCrate has several daily surveys, but also has a number of different other ways to make money. You can take offers like signing up for websites, buying online products, watching videos and more. CashCrate also regularly runs contest, where you have a chance to win extra cash. CashCrate in general has decent earning potentials, but the only disadvantage is, that the amount of surveys and offers you can take depends a lot on where in the world you live. There are most opportunities in English speaking countries. You just have to be aware that you might have to click several survey and offers before finding the ones you can participate in, so you have to be a bit patient. You can get paid in cash through PayPal or check. Be aware that the first time you request a payment, it has to be by check. After that, you can choose between check and PayPal. Onlinepanel.net is a site that only pays out through PayPal. It has several ways to earn, as you can earn by taking surveys, do Figure Eight tasks, download apps, and more. It is however not higher on the list as most of the surveys and offers it has are just offers from other survey sites. So in many cases, it makes more sense to take the offers/surveys directly on other sites, but it still does have other offers as well. It is also a legit PayPal survey site and is therefore on the list. It has the most opportunities for English-speaking countries but does have opportunities for quite a few other countries as well. Myiyo is a survey site mostly aimed towards the European market, but it also has surveys for a few Latin American countries, as well as South Africa. The main way to earn on Myiyo is by taking paid surveys, but you can also earn a bit extra by inviting friends. In general, you can only get paid through PayPal, but in Turkey and South Africa, it is also possible to get paid directly into your bank account. The payout threshold to PayPal is €20, and your account will be in euro no matter the country you live in. In time you can get to a higher membership level and thereby get a lower payout threshold. TimeBucks offers several ways to earn money. Not only paid surveys, but also a number of different ways like offers, watching videos, reading emails, watching content, and a couple of things like for example mining cryptocurrencies. Not all of the opportunities gives very high rewards, but you can also find some opportunities that are very good, and some of it is just very entertaining to participate in. One of the great things about TimeBucks is that it is available worldwide. It will, of course, vary how many surveys or offers you get depending on where in the world you live, but many of the other opportunities can be done by anyone, which is great. Once you have reached the PayPal payout threshold of $10, the payment will automatically be processed, and this happens once a week. If you want to get paid in Bitcoin instead of PayPal, the payout threshold is $50. Mobrog is an easy-to-use and simple survey site. Once you have signed up, you just wait for the survey invitations through email. It has a decent amount of available surveys, but compared to some of the other sites on this list, it often takes a bit of patience to find the surveys you qualify for. It is available in around 70 countries in the local language, which makes it very user-friendly. In all countries, it offers PayPal as a payout option, and you can get paid once you have made $7. You can also choose to get paid through Skrill. Ipsos i-Say is a site, where you can mainly earn by taking surveys, so it is very simple and easy to use. It also has a loyalty program in some countries, so you will earn bonuses the more active you are, and it has a couple of free contests you can join. Most of the surveys on Ipsos i-Say are about interesting and relevant topics. The site is available in around 100 countries. How many surveys you will get can however vary from country to country. As it only offers surveys and in limited numbers, it is great to join other sites as well, if you decide to join i-Say. Ipsos i-Say pays through PayPal in some countries, but not all. So if you are only interested in joining sites that pay through PayPal, make sure to check for your specific country before joining. Triaba is purely a survey site, and taking online surveys is the only way you can earn here. It is very easy to use. It does however not have as many available surveys, as some of the other sites on this list, but as an extra site, it can still be worth considering. Triaba is available in around 47 countries, and in all countries, it offers PayPal as a payout option. In some countries, it also offers other options like gift cards and charity donations. You can get paid through PayPal, once you have earned around $7 (the exact amount depends on your country). So that was a list of the best sites to join if you prefer PayPal as a payment method when taking online surveys. The list is not a complete list of all the survey sites that use PayPal, but it is a list of some of the best sites, so you do not have to waste time testing sites your self. If you have any comments or questions or know of a survey site or GPT site you think belong on this list, feel free to leave a comment below. I would love to hear your feedback and your experiences with PayPal survey sites as well, and will be happy to answer any questions. what site do you recommend if im from the Philippines? You can check out the list of the best survey sites for PH. That will give you some good sites. You are welcome to send me an email if you want some more specific feedback about your site. Sounds good. We’ll send you an email. Hello! Thank you very much for this useful information! May I ask you, if any of this website required PayPal Verified Account to proceed the payment? I don’t have verified account because some kind of CC user restriction in my country (Indonesia), so it will be a trouble if I have done some survey & need to cashout but the survey panel need me to verified my account. As far as I am aware, most sites on the list do not require you to have a verified account. I have not seen any of them ask for this, and I have not had problems receiving payments – I do however have a verified account. So to be sure I would advice you to find the sites that are most relevant for you on the list, and then read the specific terms on the sites before starting to work on them. Hope this helps and let me know, if you have other questions. Hello, how long would it take to complete all the surveys? Not sure what you mean? Do you mean how long it would take to join all the PayPal survey sites on this list and take all the surveys they have available? Because if that is what you mean, it would take a long time. The sites get new surveys every day, so you cannot really just complete them all but will continuously have new opportunities every day. Maybe I misunderstood your question, so feel free to ask again, if this was not what you meant. PayPal is available in Nigeria, so all you have to do is to go to PayPal’s website and create an account. It is free to get an account. according to how you have seen different sites which is the best of them all? I look at a number of different things to rank sites. First of all my personal experience with the sites, as well as what I am told from other users of the sites. I look at how many opportunities they give, how often you qualify for surveys there, how well they pay in relation to other survey sites, how good a selection of payout methods they offer, usability, if they have support, and more. Some sites might however be better for some than others depending on personal preferences and where you live. That is also why I have several PayPal survey sites on this list and have made a short summary and overview of each, so it is easy to find the ones that fits your needs this best. Hopes this answers your question, and let me know if you have any more. Thanks for this list of sites. I had no idea there were so many good ones out there that accept PayPal. Out of all of them I only recognized two of them. Which one of these websites would you say is your favorite one? Does some pay more than others, or are they all about the same? I have tried to rank them in the order with the ones I think are the best at the top. However, there can be some differences from country to country, and some of the sites are only available in certain countries. But all the sites on this list are legit and worth joining – which ones are the best for you depends on the country you live in and your preferences. But you can see the detail of each of them in the list or read the in-depth review of each of them (see link in the list), and then you will know which ones are the best for you. From the list here I think the best for me will always be swagbucks and ipsos i say. I would be lying if I say that I make a full time salary with them, but I make a decent amount, and I am happy with how they do it. So your list is okay with me so long as those two are there. Surveys are in general not a way to make a living, but they can make some nice extra cash. Glad to hear you also have good experiences with Swagbucks and Ipsos. Great post Mikael. It’s really helpful the list as there’s too many surveying companies out there that you wonder which ones are legit and pay. I know a few of the ones mentioned but haven’t tried them so I’ll do one day of these! Thanks for the feedback Dielle. Glad the info could help you. Feel free to let me know how you find the different sites once you have tried them. This is very helpful, thank you for taking time to blog as such. More power! Cheers! Thank you very much for your feedback. I appreciate it. I have been using Toluna for the last 2 years and it serves as a good form of extra income every now and then. They are definitely legit as I have received money in terms of Paypal and Vouchers. I have recently signed up for Cashcrate too and it is great that they have a referral program to expand your earning opportunity! Thanks for your comment Leo. Glad to hear you are also benefitting from paid surveys. Yes Toluna is a good and reliable company – glad that you have the same experience. CashCrate does definitely have good opportunities in some countries, and I agree that their great referral program is an added bonus. This is some very useful information. I actually attempted to get paid for surveys online a few years back but things just didn’t go well for me. It was a tough task deciphering through which companies were good and which were not and as you mentioned for several of them i had to answer a lot of qualifying questions and it really just really wasn’t worth it. So I left it alone but this article made me want to get back involved with some of these companies, so i bookmarked the page and I will be back. Thank you for the information! Thanks for your comment Ian. Glad you found the info useful and if it motivated you. It can definitely give some nice extra pocket money to do surveys, if you just find the legit and good survey sites. Be aware that which ones on this list I have made are the best, can differ depending on the country you live in. So test out which ones are the best for your location. All of the ones on this list are legit sites. Like the idea of being paid through paypal. I signed up to another one that wanted to pay me via some system I had never heard of, so I did’t continue. Approx how much per survey do you earn? Yes PayPal is an easy way to get paid for surveys, and I prefer that way myself as well. When that is said, there are however some sites that only offer other payment options that are also really great and worth considering. How much you make per survey depends which sites you sign up for. In general, surveys usually gives between $0.75-$5 per survey depending on how long they are, and which site it is on. I have recently become interested into trying survey sites after a recommendation and having signed up with a site I found that they did not do payouts through Paypal which was slightly inconvenient so I am really pleased to see your article which lists some sites that do pay out in this way. Thanks for a great post as always. Glad you found the info useful Fran. I personally also prefer sites that pays out through PayPal, but there are also a few other sites that do not offer that option that I really like. But PayPal is a very easy way to get rewards. So glad if this post has helped you to easier find out which sites offer that option so you can get paid the way you wish to.